W hile the big boys in Hollywood talk the multimedia talk, self-described "homey cyberbabe" Jaime Levy is already walking the walk: The third issue of Electronic Hollywood, her made-for-Macintosh magazine, is coming out next month. This fanzine-on-a-floppy, which 28-year-old Levy started in 1991, is a potpourri of articles with a techie slant: Hollywood’s underground film scene, new media technologies, as well as graphics and sampled music from LA’s most happening bands, all neatly packaged in one $7.50 3 ½-inch disk. 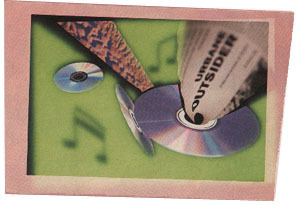 "I want to be seen as an independent publisher, sort of a cross between a record label and a magazine, because I get to use music and graphics along with text," says the paperless publisher, who put the cyber in Billy Idol’s "Cyberpunk" by creating the interactive floppy that came with some of the CDs. She’s also a contributor to Digital Popcorn, a new LA-based on-line service. The first two issues of Electronic Hollywood—which is available at two LA bookstores, Amok in Silver Lake and Big & Tall on Beverly—each sold about 2,000 copies. Reaction has been positive. "Being able to click on a picture and get more information is really cool," says David John Etzen, a Pasadena offset printer and founder of a local arts collective. "The potential of combining hypertext music and all those other elements can have so much more depth than a paper magazine." Levy says her Bay Area friends "were mouthing off about how San Francisco was going to be the multimedia capital, the new electronic Hollywood." So the born-and-bred Hollywood native dubbed her digital publishing company Electronic Hollywood to spite them and bring the name home. Lately, however, she’s been putting together Electronic Hollywood and doing her Digital Popcorn report from virtual LA—meaning an East Village loft in New York. "You know, work," she shrugs, explaining that a teaching position at NYU and a megabuck multimedia-development job at IBM were too tasty to pass up. "But that’s all temporary," she promises. "I’ll be back as soon as I can make it happen."